Two years ago, a coalition of local advocacy groups—SAAS, or Santa Ana Active Streets—hosted a year-long program to train residents and community members in advocating for active transportation and civic engagement. Up to that point, SAAS was new and still finding its feet, and had mainly focused on activities around bike safety, including bike repair, helmet giveaways, and assisting in bike counts. These efforts were commendable for a two-year-old group, but they were still incremental and did not move the needle toward the systemic changes the coalition was hoping to achieve. It wouldn’t have been possible to create and lead the program without the help of the coalition that formed SAAS. The representatives from each group in the coalition — which included Latino Health Access, KidWorks, NeighborWorks OC, and The Bicycle Tree — championed the ATLP in their respective organizations and spread the word about it to their members. Each organization allowed the use of their office to store materials, print flyers, and host organizing meetings; one of the member organizations even found a childcare provider for the ATLP workshops. SAAS’s mission has focused on creating safer and equitable streets. When a street-widening project threatened to displace residents, SAAS members rallied against it. The leaders in training also led outreach efforts for a city planning process, going door to door to talk to people, making phone calls, and presenting information at churches and schools. But SAAS’s activities were not based on ideas proposed by transportation planners, engineers, or policy makers. They were created by residents who saw that their streets were unsafe for people who walked and biked and that something needed to be done. Below is a short history of the founding of SAAS and what makes it distinct from transportation advocacy groups in other parts of the country. It includes some of the guiding principles that helped form the coalition. In 2012, NeighborWorks OC, a local housing nonprofit, took a group of Santa Ana residents to the Community Leadership Institute. That annual event, hosted by the group’s national umbrella organization, NeighborWorks America, trains residents from across the country in leadership and technical skills. As part of the program, attendees worked with their local partners to draft an action plan for a project they wanted to see implemented, and then they received seed money to finance their idea. The Santa Ana residents decided that bicycle and pedestrian safety was a priority, and later that year they hosted a mini-Open Streets event at the Pacific Electric Bike Trail. Although those residents were committed to their work with different organizations, they wanted to stay connected and continue the collaboration. That initial connection would lead to the founding of SAAS. Sometimes an organization’s focus and work are determined by outside funding sources, but they may not be in tune with what local communities need and want. Therefore, it’s important to find out where priorities match with those of other local organizations and work together to have a larger impact on the issues than one group can alone. Santa Ana has a strong pedestrian and bicycling community, yet it continues to be one of the most dangerous cities for people who walk and bike. More than 55 percent of Santa Ana residents do not have access to a personal vehicle, making walking, rolling, biking, and public transit even more important to them. Yet in the most recent California Office and Traffic Safety rankings, which compares cities of similar size, Santa Ana has the third highest number of pedestrians killed or injured by a vehicle, and fourth highest among cyclists. Each group in the coalition that supported the ATLP knew the residents they worked with felt Santa Ana streets were unsafe. They knew residents bike and walk regularly, to get to work, to school, or for exercise. And they also had friends and family members who were hit or nearly hit by drivers while riding or walking. Although these different organizations had varying missions and goals, when they zoomed out from the specific focus of their work, they identified active transportation as an important common theme. That gave them the opportunity to identify other like-minded organizations and invite them to collaborate. The groups that participated in the founding of SAAS included Kidworks, with staff working on Safe Routes to School; Latino Health Access, through the Wellness Corridor initiative; The Bicycle Tree, which offered bike maintenance and safe riding classes and clinics; and NeighborWorks OC, which supported residents that had taken part in the Community Leadership Institute and wanted to improve the conditions of the Pacific Electric Bike Trail. El Centro Cultural de Mexico, a local community organization that works with the Santa Ana Latinx community, was also involved, with specific individuals researching the city’s urban history and impacts on the community. Most of these organizations were created from interactions between residents who attended the 2012 Community Leadership Institute event, and many of the SAAS founding members ultimately met through the steering committee for Latino Health Access’s Wellness Corridor project. That steering committee was focusing on making the downtown Santa Ana area more active and safer for current residents, especially for those walking and biking. Since residents still made up most of this budding coalition, they held limited sway over the organizations they belonged to. So the residents identified decision-makers within their organizations and began recruiting leaders to the coalition. From Latino Health Access, Director of Community Engagement and Advocacy Programs Nancy Mejia was recruited because she was overseeing the organization’s Wellness Corridor initiative. Omar de la Rivas, a former KidWorks youth bike organizer, was recruited by a Latino Health Access volunteer. Alex Green, a local resident and advocate, recruited Paul Nagel, the executive director of The Bicycle Tree. Once everyone was at the table, each organization and individual got to know one another and looked for ways to collaborate. The Bicycle Tree, a local bicycle cooperative that focuses on bicycle safety and teaching bike maintenance skills, offered SAAS volunteers free use of their bike stands so they could learn how to fix their bikes. Kidworks, a local youth development program that has been influential in local political activism, held a Bike It! Santa Ana campaign that aimed to push for more bike lanes in areas that youth frequented, specifically on Edinger Boulevard. The youth became the de-facto bicycle experts; they taught fellow SAAS members concepts of good street design and led conversations during planning processes. Latino Health Access were versed in community engagement and public health strategies, and their involvement with families and the elderly also gave them a lot of knowledge about their constituents’ reliance on walking and biking. Mothers formed exercise walking groups; parents accompanied their children by bike to school; sons and daughters often walked or biked to school together. NeighborWorks OC, as a homeownership and housing nonprofit, understood the importance of resident-led initiatives. These principles helped them act as the glue holding the coalition together and coordinating its activities, and they supported its growth. 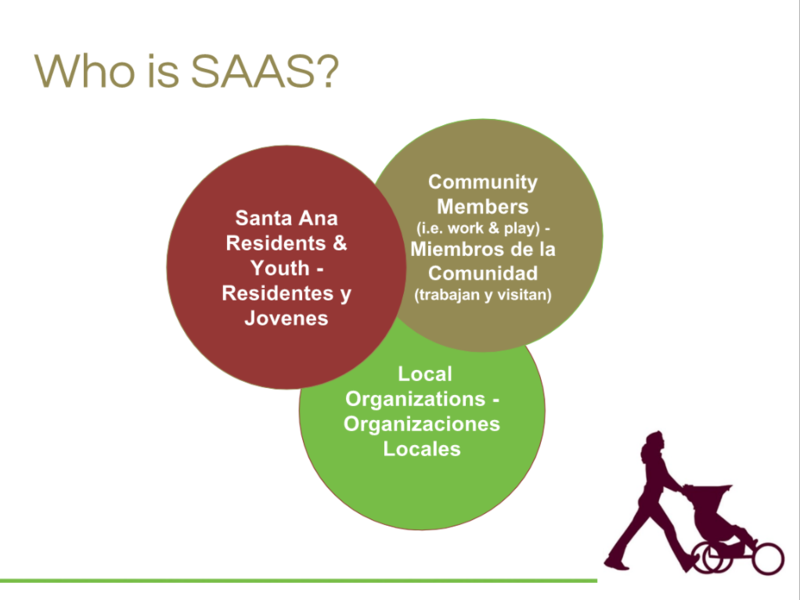 While SAAS did not have formal organizational status — it was not registered as a nonprofit, for example — nor its own staff, NeighborWorks OC, Latino Health Access, and KidWorks often pooled their resources to keep it going. When SAAS wanted to offer four paid intern positions through the ATLP, Latino Health Access was able to use its nonprofit status to host them. In SAAS’s 2016 bike safety campaign, which offered cycling classes and hosted evening bike helmet and light giveaways, The Bicycle Tree hosted the activities under their nonprofit status. Volunteer contributions were also key on an individual level. Super-volunteers like Jessika Gomez-Duarte, a marketing professional who works in Santa Ana, gave her time to design flyers, post on social media and even hand-make most of the signs for the mobile photo booth during Santa Ana’s second Open Streets event. Jorge Arredondo, a landscape architect and Santa Ana resident, worked with KidWorks youth and other residents to design the connector bike lane between the Pacific Electric Bike Trail and the city’s downtown. SAAS members understand that their group can have a much greater impact only by thinking collaboratively. That means leveraging resources to improve one bike trail by working with a coalition that wants a network of trails. That means using a $12,000 grant opportunity to negotiate an agreement between individuals and community-based organizations for a year of workshops, bike rides, and advocacy projects. Cross-sector support and commitment. Organizations working on housing, youth development, public health, bicycle education, and arts and culture have all contributed to SAAS for many years. Working together allows everyone to look at an issue through multiple points of view, and to think in terms of the bigger picture. Forming SAAS has allowed the coalition to think about active transportation advocacy multi-generationally, multi-sectionally, and multi-lingually. Meaningful community engagement versus traditional bike/ped advocacy. SAAS is made up of residents, community members, and organizers—not necessarily planners or engineers. When SAAS members advocate for safe streets, it’s not because they started with ideas about road diets, or bulb-outs, or bike lanes. They listened to community members first, and have evolved from there — today their work includes concerns about displacement as a result of new investments. Historically unincorporated voices in active transportation advocacy are leading SAAS work. Youth, women, and undocumented residents lead SAAS. Almost all are residents, and some are advocates with long-term ties to the community. The SAAS model isn’t for everyone. Santa Ana Active Streets benefits from Santa Ana’s rich history of building community leaders and hosting local institutions that support resident-led efforts. The coalition formed slowly—over a period of four years—to cultivate ideas and leaders, something many might feel is too much time. For nonprofits, the decision to join a coalition is not always as easy as securing funding and creating projects, and sometimes leadership priorities conflict with a coalition’s broader goal. But if a goal is to improve the quality of life of the most vulnerable communities, teaching residents about design guidelines for safer sidewalks or advocating for more bike lanes can go only so far. Having a diverse coalition allows SAAS to push harder on the question of what it means to create equitable and safe streets and places. Everyone pooling their efforts gives hope that they can get there. This post has been made possible by the grant-funded Focus Cities California program, a joint project of UC Berkeley SafeTREC and California Walks that supports increased safety in walking and biking. Saw them hard at work at the Hazard Ave Go Human event this past weekend. Also a big fan of the bicycle tree. They’ve been committed to bringing the whole self-confident bicycle ownership to low income communities. These things are still a work in progress in the Santa Ana, but the work is starting to bear fruit. If you look at past stories I’ve done I’ve tried to track the progress of the City to make policies and projects more pedestrian/bike friendly. Did you know Santa Ana has the first Vision Zero plan in the County? Did you know it approved a downtown Complete Streets plan last year and is just wrapping up a Central Santa Ana Complete Streets plan? And while most folks may knock plans as things that collect dust, the City has been awarded more than $50 million in pedestrian and bicycle projects in the past 3-4 years. It may seem like the city has a long way to go — especially after decades of planning and developing around the car — but the foundation is being put in place for some really cool changes to happen in the near and distant future. I’m kind of shocked to hear the terms pedestrian and bike friendly mentioned in the same sentence as Santa Ana. Having grown up in the area the cities of Orange County are the least pedestrian, bike and transit friendly places I can think of. Even the beaches are horribly auto-centric even though they are popular places for beach goers on foot and bicycles. For example, you have to cross eight lanes of the car-choked Pacific Coast Highway just to get to the beach even in the popular areas. There are no bike lanes and not even sidewalks in many stretches. The pedestrian and bike infrastructure is either horrible or non-existent. I visit family there almost every year and nothing has changed. More than 45 people came out to a busy street in Santa Ana on December 14 to walk together and talk about the history and future of the surrounding area. SAASy Mujeres is a bike ride for women-identified folks that want to meet new people, get healthy, and learn about advocacy efforts in Santa Ana. It's for residents and community members who want to ride around the city but don't feel safe or confident doing so by themselves. Here is a roundup of activities related to sustainable communities that are coming up soon in and around Orange County.